Engineer Kenneth Kufluk also stated his disagreement with his boss that Jones hadn’t violated any rules. “I don’t agree with everything Twitter does or doesn’t do. If we can consistently enforce the policies and terms of service for the platform, that’s a good thing. But it doesn’t mean we should be satisfied with the policies we have,” another Twitter engineer, Mike Cvet, wrote in response to his boss. “It is impossible to promote healthy dialog with bad-faith actors, who regularly produce toxic, dangerous and demonstrably false conspiracy theories; the objective of which is to mislead, radicalize, divide,” Cvet said. “Our policies need to change, so that constructive discourse is not only possible, but commonplace. And so that our rules and the behavior they condone are something to be proud of,” he added. A Twitter spokeswoman told the The Daily Caller News Foundation that Twitter’s policies are constantly evolving and pointed to Dorsey’s tweets and a Tuesday blog post for further information. Jones has a long track record of spreading conspiracy theories, including falsely claiming that the 2012 Sandy Hook shooting in Connecticut was a hoax. But Jones’ sudden banning across social media platforms has led to concerns that mainstream conservatives will soon follow. “The math here is simple: There is a growing belief that speech can be considered violence, that racist speech is by definition violence and that conservative thought is inherently racist. I don’t need a whiteboard or lizard people to connect the dots,” Bunch wrote in an op-ed. The social media company suspended conservative activist Candace Owens Sunday, after she quoted a New York Times writer’s anti-white tweets but replaced the word “white” with “black” and “Jewish.” Following a backlash, Twitter reversed Owens’ suspension, which it claimed was done in error. Twitter in July suppressed four Republican congressmen on the site due to an algorithm change meant to punish “bad-faith actors.” All four are members of the conservative House Freedom Caucus. Twitter later said the suppression wasn’t intentional and that the congressmen’s accounts were penalized for having the wrong followers. That same month, Twitter suspended conservative commentator Kathleen McKinley for two tweets: one that opposed clearing self-identified transgender persons for military duty and one that tied “extreme Muslim beliefs” — rather than mainstream Muslim beliefs — to the practice of honor killings. 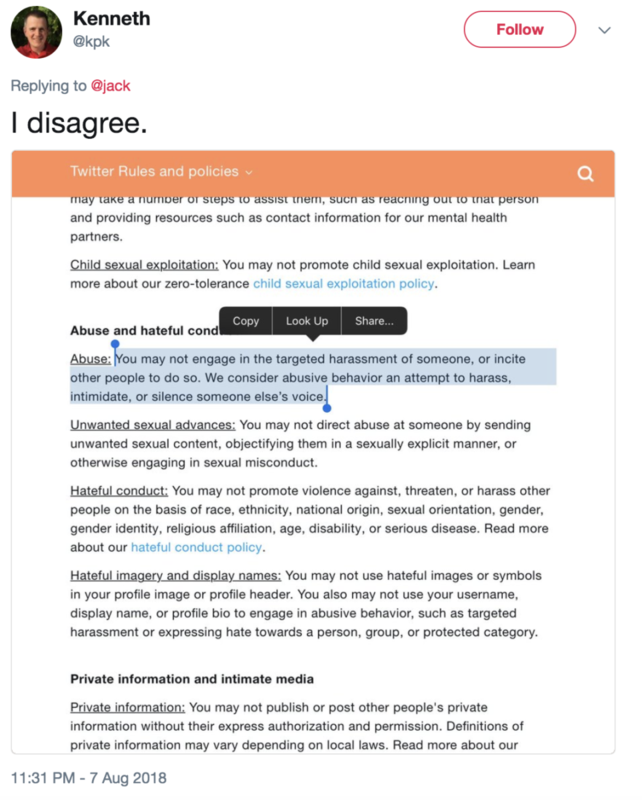 Twitter did not apologize to McKinley or say her suspension was in error.